Nima Alamian made a shocking early exit in the Men's Singles event of the 2016 Belgium Open, after his Round of 32 opponent Simon Arvidsson raced to a 4-0 victory. Iranian player Nima Alamian was seeded 12th for the 2016 tournament, and had high expectations having won the Belgium Open only last year. But Alamian’s hopes and dreams of defending his title soon came crashing down to earth, as Sweden’s Simon Arvidsson (30th seed) caused a big upset. The opening game between Alamian and Arvidsson was closely fought out, but it was the Swedish competitor who made the brighter start to the tie and his success in game one set up a one-sided affair. Three consecutive game wins followed for Simon Arvidsson to seal arguably one of biggest upsets of the Men’s Singles category at the 2016 Belgium Open, eliminating Nima Alamian in four straight games (11-9, 11-6, 11-6, 11-6). “Everything went perfect and I immediately found the good tactics. Alamian couldn’t do anything. Two years ago I was in the final here. A great experience. Now there is no Samsonov and Ovtcharov, but I have no pressure. My form is really good and we will see what tomorrow brings” – Simon Arvidsson (Sweden). Rather unexpectedly Simon Arvidsson’s opponent in the last 16 will be India’s Sathiyan Gnanasekaran (seeded 25th), following his comeback victory from 0-2 down to win 4-2 against the sixth seed Jon Persson (Sweden). Thiago Monteiro of Brazil endured two marathon matches on day three in De Haan, requiring seven ends to progress through his Round of 64 and Round of 32 encounters. Leading 3-0 in his opening tie against Jonas Stener (Sweden), Monteiro was cruising toward victory. Stener, however, came back at the Brazilian with three game wins of his own to level the match at 3-3. Eventually Monteiro managed to clinch the win (11-7, 11-5, 11-6, 6-11, 14-16, 6-11, 11-8), but more difficulties were lying ahead for the 35-year-old. The Round of 32 encounter with Czech player Tomas Polansky saw a rather different situation unfold, as Thiago Monteiro was the contestant who was forced to come back from behind. Polansky had put together a 2-3 lead after the opening five ends, but back-to-back games in Monteiro’s favour (6-11, 11-5, 11-8, 6-11, 6-11, 11-4, 11-7) made sure that Latin America would be represented in the final 16. 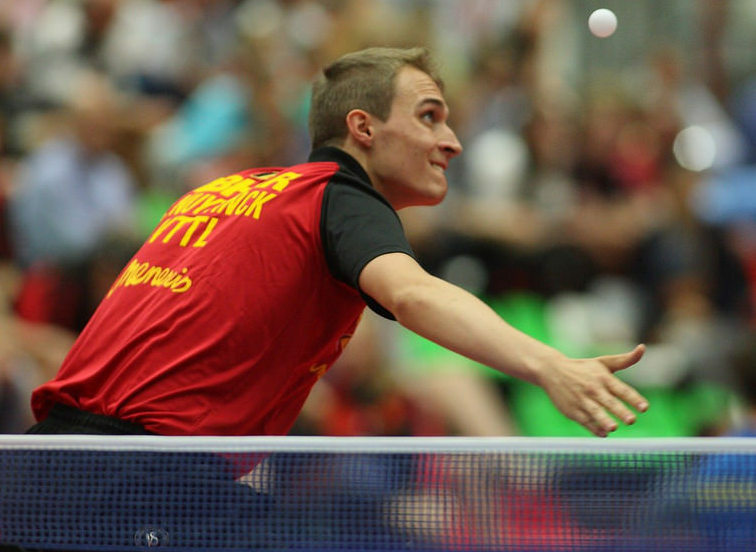 Belgium won’t be without their own players competing on day four, after Florent Lambiet and Cedric Nuytinck both achieved successful results. Florent Lambiet emerged as the winner against Germany’s Dennis Klein, who had registered a shock win by knocking out the third seed Cazuo Matsumoto (Brazil) in the previous round, across five close games. Cedric Nuytinck beat Sweden’s Viktor Brodd by a similar 4-1 scoreline. “I had a good feeling against Brodd. My strokes were fast and I had good control. Hopefully I can keep this form a bit longer… Tomorrow will be a tough test against first seed Omar Assar. He also plays in French competitions so he knows me quite well. I think he will have some pressure tomorrow because he knows that I am in a good form. If I can use the crowd I can certainly win.” – Cedric Nuytinck (Belgium).